Fall for All!!! Beautiful fall creations featuring products from our amazing new Holiday Catalog will be featured!!!! New England we have the most vibrant colors! Lots of apple picking, pumpkins & corn stalks, hay bales & lots more happen around here! Although this year we've had so much rain it's hard to see any colors at all! So looking forward to this blog hop to make my colors shine!!! This was a fun, clean-and-fairly simple card to make. That's my style!!! This is the Many Blessings stamp set! 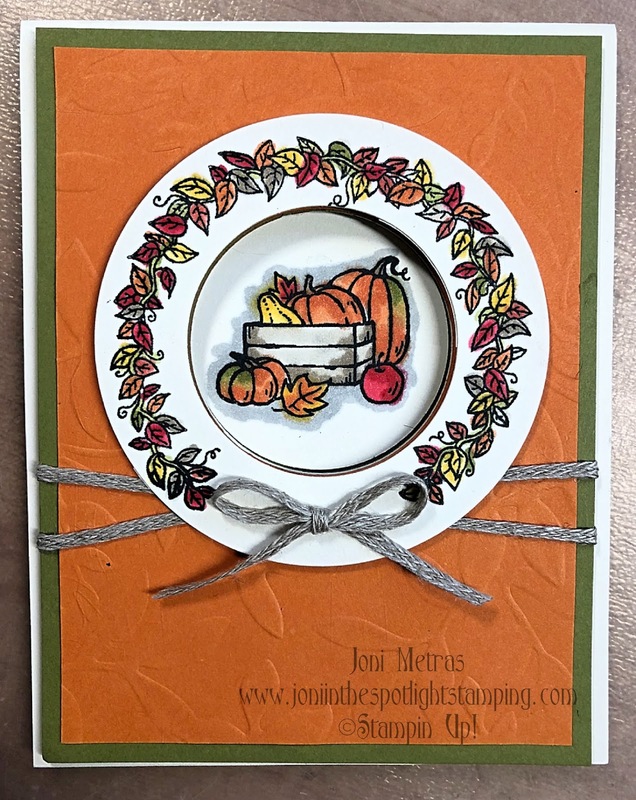 It was inspired by one of Stampin' Up's Million Sales Achievers-Ruth Snyder! I really like it because it works for anything from early fall right through Christmas! A super versatile, fun stamp set! 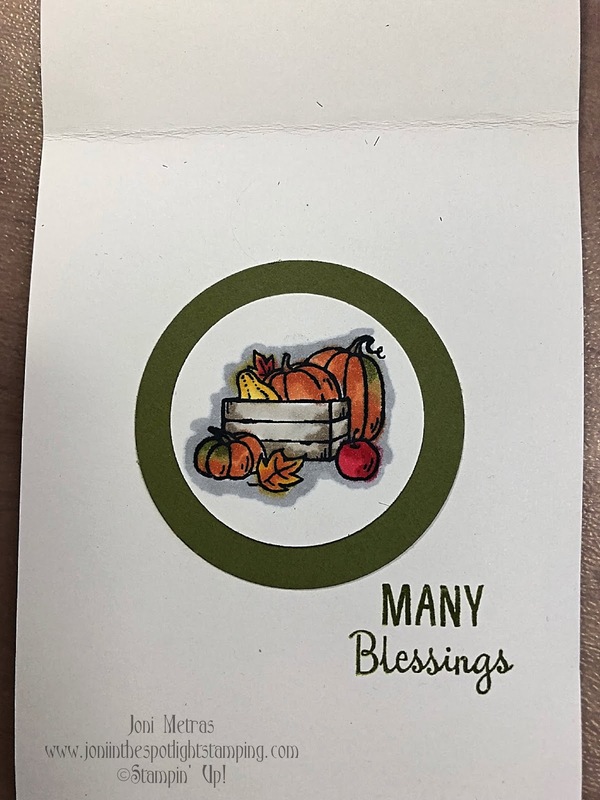 And it's perfect to use with our amazing Stampin' Blends! Ok I love to color. Don't judge! lol This like "grown up" coloring! And I love how these colors really made me think fall! 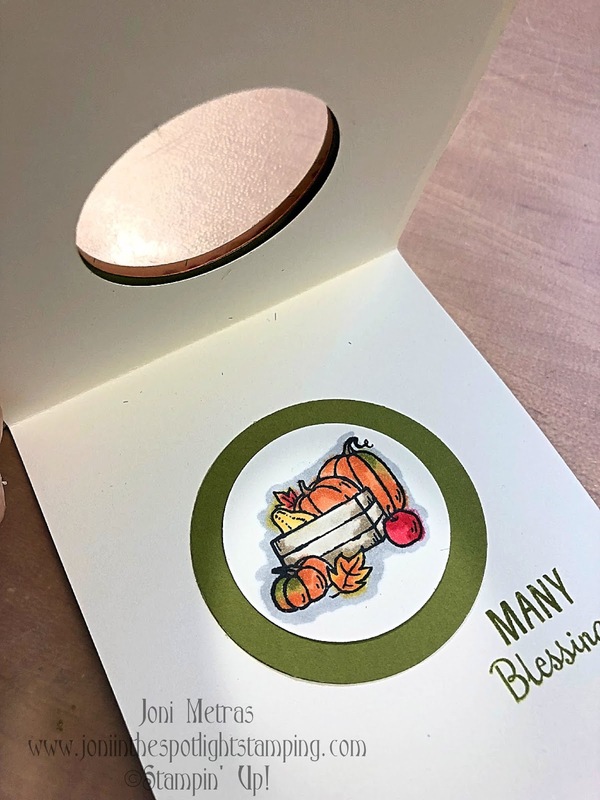 I used the Layered Leaves Dynamic Embossing Folder. Now usually I spritz the card stock a bit with water before I emboss with these folders, but this time I wanted a softer finish-so no water! Still pretty but a nice light finish! I love this kind of peek-a-boo style card!!! It just adds a little something extra to a pretty greeting card. Easy to do with all the Layering Circle Framelits & Circle Punches we have! I used a combo here! And the photopolymer stamps are "flexible" so i was able to fit that wreath-like stamp on the round strip! Finished it all off with the Braided Linen Trim! I am very happy with this one! 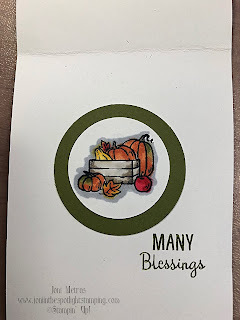 Love my Stampin' Blends! 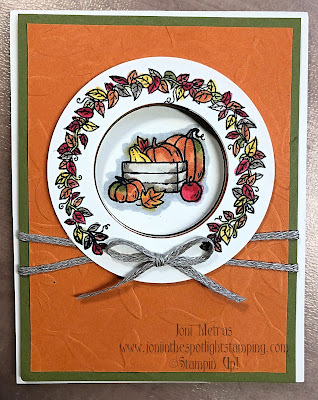 Now hop on over to Megan's blog & see what she is featuring for Fall for All!!! Then keep going & check out everyone else's! Just click on her name or the icon below! Happy fall y'all!!! I love this stamp set - it's one of the best values and varieties in the catalog! Oh my goodness, what a fun card! I love the peek-a-boo style! And the way you have your ribbon on there is beautiful! TFS! Joni that is so cute! Thanks for hopping with us this month! Great card all around! Your coloring is wonderful and love how the layers bring so much dimension! Such a fun card! I love this little set too! Love the peek a boo. Thanks for sharing! Joni, this card is spectacular! I have to try it! LOVE the peek a boo style card!! I love this! It's so cool with the cut out front. 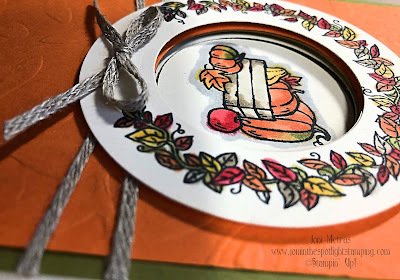 Love the coloring in your pretty card! VERY beautiful & cool card! Great coloring and love the peek-a-boo! At first I thought it was a pretty piece of china! Great card!! About 15 years ago, I was invited to my first Stampin' Up! party! I had no idea what that even was! I thought it was some sort of religious revival meeting! But there was mention of margaritas, so I figured why not!! Then my friend said, "No, it's making beautiful things with rubber stamps!" I thought, "Rubber stamps?! Ya, right!!!" Well, it took about 12 minutes before I was completely hooked! I spent about $175 that night on stuff I didn't even know what to do with! But I quickly learned, and have been a fan ever since! I still have my first stamp set & refuse to get rid of it! Now as a demonstrator, I get to have a ton of fun sharing what I love to do! I have made some wonderful new friends! I am happy to offer classes for beginners, on technique trainings, or just about anything you may want! Like it all? Place an order! Love it all? Have a workshop! WANT it all? Join our team! (c)2012.Joni in the Spotlight Stamping. Awesome Inc. theme. Theme images by molotovcoketail. Powered by Blogger.